Also see our Spiritual Image Gallery for other inspiring image of the Heavens. 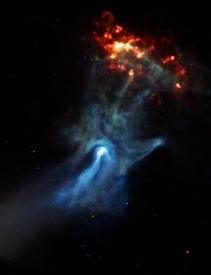 Seemingly, a Heavenly Hand reaches out to a spinning neutron star, releasing vast amounts of creative energy. Named by some as "The Hand of God". A small, dense object only twelve miles in diameter is responsible for this beautiful X-ray nebula that spans 150 light years. At the center of this image made by NASA's Chandra X-ray Observatory is a very young and powerful pulsar, known as PSR B1509-58, or B1509 for short. The pulsar is a rapidly spinning neutron star which is spewing energy out into the space around it to create complex and intriguing structures, including one that resembles a large cosmic hand.